The Diffusion Simulation Game is a game developed by Indiana University in which players explore strategies that result in the adoption of innovation in a fictitious junior high. The goal is to get stakeholders (the school principal, teachers, and support staff) to adopt peer tutoring. As a player, you can decide whether to gather information, talk to people, visit places, or ask for help as various prompts are presented. 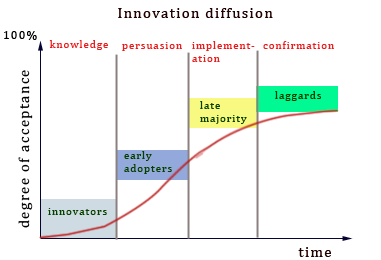 The game’s underlying model is the diffusion innovation theory. “Diffusion is the process by which an innovation is communicated through certain channels over time among the members of a social system” (Rogers, 2003, p.11). According to this theory, each member in the social system follows a certain process in adopting innovation. Within a given social system, there will be different innovation adopter types: innovators, early adopters, late majority, and laggards. Opinion leaders and gatekeepers will also influence the uptake of innovation by a social group. When a certain number of members of the social group become adopters, innovation begins to spread rapidly. Not surprisingly, there’s a certain calculus that informs adoption—primarily a cost-benefit analysis. Do members of the group perceive that the innovation has value? What are the costs of the innovation? How disruptive will it be? Is it compatible with existing values and work flows? How hard is it to use? The likelihood of adoption also is influenced by a group’s tolerance for ambiguity and uncertainty and different stakeholders will have different views of costs and benefits. The Diffusion Simulation Game illustrates the practical impact of innovation diffusion. Innovation requires both a change agent (you, in this game) and the willingness of a particular social group (the stakeholders in a high school) to adopt innovation. This willingness can be manifested in all sorts of practical ways—just see how difficult it is to even schedule an interview with the prinicipal in this game! Individual members of this social group will be more or less receptive to the idea of change and can be change agents in their own right. Why should instructional designers care about this? Even if you’re not likely to ever try to influence the members of a high school to implement change, the game is worth playing for the more far-reaching lessons it offers.